American carbon fibre component manufacturer is updating its rim range. A new rim will show up very soon, and a rim is slightly upgraded.The current range is composed of 8 different rims, from 4 different depth. 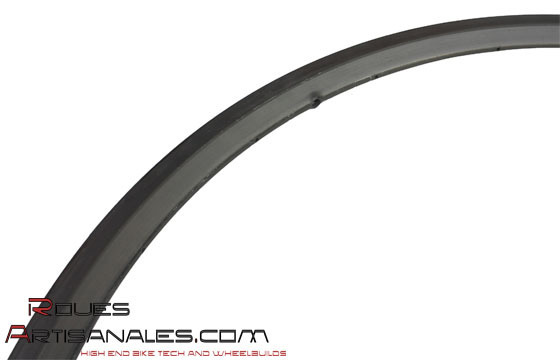 The 1.24, 24mm shallow is an extremely light tubular rim. Its weight is sub 220g. The 1.38, 2.38, 38C are 41mm deep, and weight between 275g and 410g depending on their version: light tubular or clincher. The deepest versatile rims are the 1.68, 2.68, 68C, 66mm deep. They weight from 350g to 475g, here again, depending on their version. Finally, the 112mm deep rim is made for very special events. It easily makes sub 1 kilogram wheels. It even allow sub 800g wheels if the components are well chosen. The little 1.24 is changing: both its shape and height are modified. Indeed as a 24mm deep rim, Edge had difficulties to make a clincher rim out of it, it wasn’t possible to pass the bladder that makes possible the manufacturing of a clincher rim. Thus the modifications concenr the depth which is a bit over 25mm, and the brake track/side walls transition which is very smooth instead of creating a sharp edge. These two updates increase the internal area, allowing the bladder of a clincher version to pass. Beside it, we can expect a little aerodynamic improvement. properties. This shape is close to the one of the 1.68, and is completely different from we are used to see on the 1.38 which is concave (curved). This new rim should be the most versatile of the range. The 1.38 will still be made, and will be perfect for mountain, for riders who can’t afford using the very shallow 1.25 rim.